BMW X5 xDrive 30d Design Pure Experience 5 Seater is mid range variant in its model lineup. Its powerful engine mated with an efficient eight speed automatic transmission gear box, which delivers the torque to all four wheels with the help of an xDrive intelligent 4WD system that has variable torque split. This helps to achieve a top speed of 230 Kmph, while crossing the 100 Kmph mark in 6.9 seconds. This variant features an advanced BMW driving experience control that features four modes including Comfort, ECOPRO, Sport and Sport+. This vehicle has an efficient braking mechanism, which is further augmented by ABS along with electronic brake force distribution and brake assist system. It also has cornering brake control and electronic parking brake along with auto hold, which adds to its safety aspects. At the same time, it comes with an adaptive suspension package comfort, which includes infinite and independent damping along with self leveling rear suspension. This luxurious SUV has an exclusive character package that features several styling aspects including tailpipes with matte chrome finish, remote control key with buttons in chrome, bumpers with titanium inserts, decorative side moldings, stainless steel override guards all over and exterior mirrors along with B and C pillars finisher in black high gloss. On the other hand, it internal cabin gets cutting edge features like a 360 degree camera for parking assistance, an innovative instrument cluster with road sign information, and a ventilation system with black panel. Like several other models from the company, this vehicle is also coming into the market under the CKD route and is going to compete with the likes of Audi Q7, Mercedes Benz M Class and other such contenders in its segment. The designers have done a fabulous job in giving this sports utility vehicle a captivating appearance. It has a large body structure along with decent ground clearance, which makes it capable for off-roading. Its exteriors inherit the signature 'X Series' design language, which gives it a wide and aggressive stance. The large bumper houses an air intake section for cooling the engine and it is flanked by a couple of round shaped LED fog lamps. The sleekly sculptured headlight cluster comes incorporated with signature adaptive LED headlamp rings along with side turn indicator. It is also fitted with LED daytime running lights, which adds to the elegance. Its kidney bean shaped radiator grille has a thick chrome surround and vertically positioned slats, which gives the frontage a distinct look. Its side profile is lustrous and designed with a few strong character lines and chrome plated window sill. Its wheel arches have been equipped with a set of 18-inch, V-spoke style alloy wheels that further enhances its sporty appeal. The electrically adjustable outside rear view mirrors come with heating as well as memory function. The rear profile is designed with a windscreen, which is surrounded by a thick glossy black guard along with a body colored roof spoiler. It is further accompanied with LED third brake lights. Its rear bumper gets a two tone look, thanks to the black colored protective cladding and an aluminum under guard, which gives a motor sport inspired look. It is further equipped with a pair of reflectors along with two chrome plated exhaust pipes. The internal cabin has a lustrous design with a lot metallic and wood based inserts, which gives it an upmarket finish. The best part about the interiors is its cockpit, which has a lot of leg, shoulder and head room. The car maker has equipped it with several innovative features like an automatic AC unit, advanced infotainment system, stylish instrument panel and several other control switches on center console. It has a three spoke steering wheel with silver inserts and is mounted with audio, cruise control and call function buttons that adds to the comfort level. In terms of seating, the cabin is incorporated with ergonomically designed seats, which offers ample leg space for all passengers. The rear bench seat comes with split foldable facility, which helps in increasing the luggage space. Apart from these, the car maker has equipped the cabin with several utility based aspects including cup and bottle holders, interior rear view mirror with automatic anti dazzle function, assist grips, storage unit, glove box compartment and several other such aspects. Under the bonnet, it is fitted with a sophisticated 3.0-litre, diesel engine that comes with a displacement capacity of 2993cc. It is integrated with six cylinders and twenty four valves and with a twin-power turbo charging unit. The car maker has further equipped this DOHC based engine with the latest common rail direct fuel injection system, which enables it to produce a maximum power of 258bhp at 4000rpm that results in a peak torque output of 560Nm between just 1500 to 3000rpm. This commanding torque output is transmitted to all the four wheels in the form of AWD layout via an 8-speed automatic transmission gearbox. It can deliver a minimum mileage of 12.28 Kmpl on the city roads. While it has the ability of producing a maximum of 15.35 Kmpl on highways, which is quite good considering its power and stature. Its front wheels have been equipped with sophisticated ventilated disc brakes, whereas its rear ones are fitted with conventional disc brakes. This braking mechanism is further enhanced by anti lock braking system along with electronic brake force distribution and emergency brake assist. In addition to these, it is also equipped with a sophisticated electronic stability program and several other traction control functions. On the other hand, it comes with a sophisticated adaptive suspension package that features air suspension system on both front and rear axles. It is being offered with an active steering system that provides precise response depending on the speed levels and minimizes the efforts required by the driver. This variant has an automatic air conditioning unit along with four zone controls and extended rear AC vents that keeps the entire cabin cool. It has an adaptive cruise control, which helps in maintaining a steady speed on the highways as set by the driver. Not to forget, its BMW Driving Experience control is the most advanced feature that provides desired driving style with the help of ECOPRO, Comfort and Sport modes. 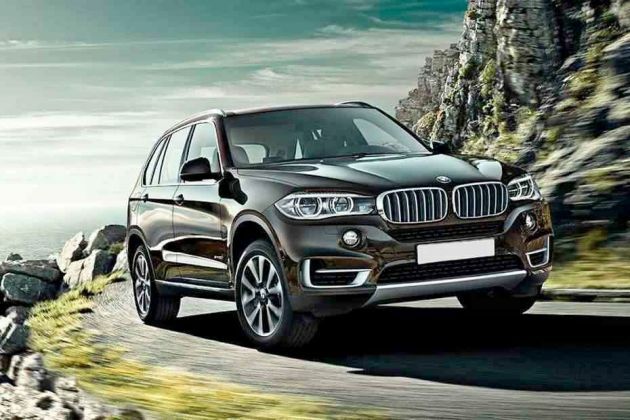 One of the most important features of this SUV is BMW ConnectDrive. It includes BMW apps, Bluetooth with handsfree and USB interface, extended Bluetooth with audio streaming, voice control, office functions and contact photo display. It also supports HiFi loudspeaker system with nine speakers. Then it has an iDrive with 26cm touchscreen display, which supports DVD player, integrated hard drive for maps and audio files. For a stress free driving experience, the company has blessed this vehicle with a lot of protective aspects. It is equipped with airbags including dual front, side and head airbags, three-point ELR belts wherein the front seats also have pre-tensioner and load limiter function. Furthermore, this SUV is also incorporated with an advanced active protection and attentiveness assist function, which keeps the driver focused on driving thereby it enhances the road safety. It has an electronic vehicle immobilizer unit with crash sensor that keeps the vehicle protected from unauthorized persons. 1. Presence of BMW ConnectDrive function adds to its advantage. 2. Wide ground clearance makes it perfect for off-roading. 1. Cost of maintenance and spares is quite expensive. 3. Authorized service stations are less.